Knee sprains are an extremely common injury and can be confusing, with a variety of different “grades” of sprain, and a variety of ways in which the ligaments can be damaged, it can be hard to even know if you’ve sprained your knee or not! Read on to find out how to assess the injury, and how to begin treating it. What is a knee sprain, and what is the difference between a sprain and a strain? A knee sprain occurs when one or more of the 4 ligaments in the knee joint are torn or twisted, usually either from an awkward movement of the knee joint or from a sudden and direct impact to the knee. A knee strain occurs when the tendons that connect the muscle to the bone are damaged. In much the same way as with a sprain, this involves a tearing or twisting of the tendon. The recovery methods for both sprains and strains are relatively similar and treatment times can vary hugely depending on which of the ligaments were damaged and the severity of the damage (the grade of the sprain). What are the “grades” of knee sprains, and what do they mean? You may also notice stiffness in the knee or a reduction in mobility, this can be an early indicator of a sprain. The treatment for a knee sprain can vary depending on the level of damage to the ligaments. However, the general method is the same. Apart from this, your doctor may provide you with anti-inflammatory medication to combat the swelling and provide pain relief. Depending on the severity of the sprain, other methods of recovery should be discussed with your doctor, health professional or physiotherapist. CoolXChange supports active lifestyles. 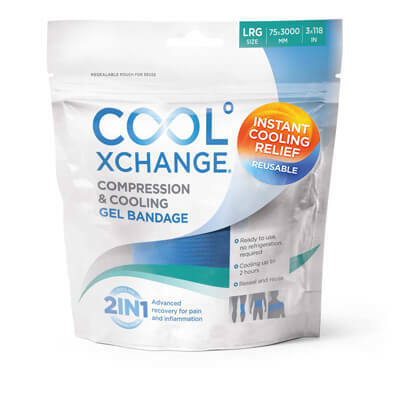 The gel bandage provides cooling and compression with no need for refrigeration. Keep the bandage handy in your first aid kit or your glovebox. Buy CoolXChange from our official online retailer. – Sore back: ice or heat? Ankle Sprain – The Hidden Cost and What to do About It?